What exactly does it mean to die with dignity? I used to think that dying with dignity was throwing oneself in the path of the bullet to save the women and children, or perhaps staring the executioner in the eye rather than sniveling and begging for mercy. But now this phrase is used in a different way, and I can't get a grasp on what it means. Somehow if Terri lives on a few more decades, and at some future time begins to age as we all will, and succumbs to one of those ailments that age brings, she will die without dignity. Or is it she will live all those years without dignity? Or is she already living without dignity and somehow in dehydrating she will regain it in death? And once she is dead, of what use will this dignity be? And then there is this idea of dying in peace. Dying in peace used to mean that one left this world at peace with the Maker he was soon to meet, so that death could come calmly and without fear. Sometimes it meant to leave this world with no regrets, no apologies unsaid, no forgiveness withheld. Now dying in peace seems to mean something Terri will not be able to do if she lives out her natural life, but will be able to accomplish if she dehydrates now. And for the life of me, I can't figure out what that would be. The other thing that puzzles me is that those who insist that Terri needs to die with dignity and die in peace also assert that Terri is aware of nothing, feels nothing, or sometimes that she does not even have a life. Ignorance, (of one's lack of dignity and peace), it seems to me, would be bliss in such a situation. So then, I am puzzled about what use this dignity and peace will be to such a person, or non-person, as the case may be. This is a re-posting from March 24, 2005. There was a time when the law of this land said that one must return a man who had escaped into a free state to the man in a slave state that claimed to own him. That was the law then, and many people obeyed that law because, well, it was the law. There was a time when the law of this land said orphanages and parents could send little children to labor in coal mines and factories and aboard ships. That was the law then, and many people obeyed that law because, well, it was the law. There was a time when the law of this land said that little black Americans had to go to one school and little white Americans had to go to another. That was the law then, and many people obeyed that law because, well, it was the law. I could cite example after example of times in our history when the law, as it stood, was simply wrong. The reason these laws no longer stand is because ordinary good people stood. They stood against the law. Fugitive slaves were sheltered by ordinary folks who found human subjugation disgusting. It wasn't famous self-proclaimed leaders or elected politicians who sat at the neighborhood lunch counter or at the front of the bus in defiance of unjust laws. It was ordinary Americans exercising the tradition of American dissent that goes all the way back to those who unloaded a cargo of tea into Boston Harbor. Ordinary people spoke out, too. They debated and petitioned and appealed. They challenged other ordinary Americans to look beyond the law and into their consciences to see what is right and what is wrong. As these ordinary people stood, and as they spoke out, the politicians and judges had to take notice and they had to consider whether or not these ordinary people had a point. It took time, and at times as the judges ruled against them, and as hearts seemed unchanged, they must have been discouraged, yet they continued to stand and continued to speak. As a result generations of Americans are more free and treated more justly. Right now the law says a disabled woman can be ordered by a court to be starved and dehydrated until she dies. The law says that even if she is able to take oral sustenance, it is illegal to give it to her. The law says a mother, a father, a sister, and a brother, as they sit beside their dying loved one, cannot offer her relief. This is the law now, and many people say we should obey the law because, well, it's the law. But the law in this case is wrong. 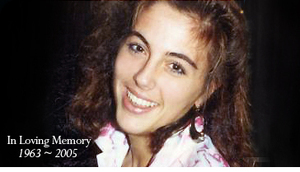 As I write this, ordinary Americans are standing and speaking for Terri Schiavo. I do not know if it will do Terri any good. I pray that God will preserve her and send her relief. But whether or not Terri survives this assault on her life, we must continue to stand and continue to speak out, because Terri is but one of many defenseless people who face unjust treatment, even unjust death, because of laws that not only fail to protect them, but also act against them. We go to great effort and great expense to add ramps and accessible rest rooms and other accessibility aids out of respect for the disabled who have challenges in mobility, hearing, and sight, but Terri Schiavo suffers from a category of disability we still refuse to accommodate. She is challenged in her intelligence and her communication. To those who define humanity by potential for productivity--by what a person can do--poor Terri fails the test. So for years she has been banished to her room. Now she must be banished from the earth, while the judges of our land drop their gavels in approval. The law is wrong. What will you do? Thanks to reader Baille for sharing the image of the document that accompanies this post. You can read Baillie's blog here. You can click on the image for a larger, more readable view. This Saturday, March 18th, is the anniversary of the day Terri Schiavo's feeding tube was removed. She died thirteen days later, on March 31st. The public airing of Terri's situation caused us to consider and debate profound issues of life and death. We asked important questions. What is life? What makes it precious? What makes life, "worth living"? What is the difference between medical intervention and ordinary care, and when, if ever, can they ethically be withdrawn? When, if ever, should the dying be treated differently than the profoundly disabled? At our best, we discussed these things on our blogs thoughtfully and graciously, in spite of the emotionally-charged atmosphere. At our worst, we angrily hurled insults and attacks at the "other side". Tim at Blogs4Terri is requesting that bloggers remember Terri Schiavo with a blogburst during the this anniversary time, by publishing on their blogs posts related to Terri's case and the cause she represents. I plan to participate, both with new posts and with a few re-posts. I will also link to other participating blogs, (blog carnival style), in three editions of Bloggers' Best for Terri Schiavo to be posted on Saturday, March 18th, Friday, March 24th and Friday March 31st. Submit your links to me at this gmail address. Send me the name of your blog and the title of the post and URLs to both. Also send a short, one or two sentence description of the post. There is no religious requirement for posters. Please send your thoughtful posts, and not attack pieces. I will reject anything I find inappropriate. Let's honor Terri's memory by making the argument for why lives like hers should be protected, respected, and loved. See last years posts here and here. Also see the Terri Schindler Schiavo Foundation site. A while back I posted some excerpts from interviews and reviews of Schiavo attorney George Felos' writings. One of the things I suggested readers do was to go to Amazon and read the reviews from folks who had read his book. There you would have found that his readers seemed to be a bit weirded out by the book, and described things such as Felos reporting that he had caused an airplane he was in to begin to fall from the sky until "God" interrupted his thoughts and told him to be careful what he thought about. I was reading those reviews just yesterday and thought a couple weren't there any more. Today a commenter on my site reported that all the reviews except a positive one have been removed. I checked it out, and sure enough, the old reviews are gone and what remains is a glowing review from a woman by the name of Joyce D'Auria who describes herself as "a writer in Florida." A Google search didn't reveal anything she had written except this review. As I check back with Amazon now I see new reviews by readers wondering what happened to the old reviews. UPDATE: Now the new comments are being removed as well. Kate Adamson (see her story here) tells me she and her husband, Steven Klugman, will be on Larry King tonight (Thursday). Please pray that God will be with them as they travel and with them as they speak. May God use the testimony of these beautiful Christians to soften hearts that are hard toward the disabled and encourage us all to cherish and protect the human life God gives when He chooses and takes when He chooses. And the LORD struck the child that Uriah's wife bore to David, and it became ill.
16David therefore pleaded with God for the child, and David fasted and went in and lay all night on the ground. 17So the elders of his house arose and went to him, to raise him up from the ground. But he would not, nor did he eat food with them. 18Then on the seventh day it came to pass that the child died. And the servants of David were afraid to tell him that the child was dead. For they said, "Indeed, while the child was alive, we spoke to him, and he would not heed our voice. How can we tell him that the child is dead? He may do some harm!" 19When David saw that his servants were whispering, David perceived that the child was dead. Therefore David said to his servants, "Is the child dead?" 20So David arose from the ground, washed and anointed himself, and changed his clothes; and he went into the house of the LORD and worshiped. Then he went to his own house; and when he requested, they set food before him, and he ate. 21Then his servants said to him, "What is this that you have done? You fasted and wept for the child while he was alive, but when the child died, you arose and ate food." 22And he said, "While the child was alive, I fasted and wept; for I said, "Who can tell whether the LORD[a] will be gracious to me, that the child may live?' 23But now he is dead; why should I fast? Can I bring him back again? I shall go to him, but he shall not return to me." While Terri Schiavo lived, we fasted and prayed and sought for her defense. Now that she has died, we should do as David did and get ourselves up and worship the Lord.It was not His will to save her from this injustice. The Lord gives. The Lord takes away. Blessed be His name for giving and taking the life of Terri Schiavo. May He grant great comfort, and a fuller revelation of Himself to those who mourn for her. May He also grant that all of us learn from this experience and do what He calls each of us to do to prevent things like this from happening again. May He teach us to protect the voiceless, value human life, even when it is possessed by those who can do so little, and may He cause us to recoil from the dehumanization of the severely disabled. May He grant us the clear view of our own poverty that will allow us to view the poverty of others with charity and humility. I share this verse because there are many who may be tempted now to view the government, or specifically the judiciary with fear. But dear Christians, we must act and react not out of fear of earthly powers, but of the God who raises up kings and takes them down, the God who saves souls and condemns them. This is the same God who promises that all things, even the difficult things, will all ultimately work out for the eternal good of His people--the people who love Him, the people He loves. God has sent a pestilence of death upon us. We have killed our children. We have killed the voiceless and the helpless. Terri Schiavo is only one of many. So with fear and trembling, let His people worship Him now, confessing the sin of our land and asking for His mercy and His healing. In a previous post I brought out how support for saving Terri's life is coming from both sides of the political spectrum. To some this is an issue of discrimination against the disabled, as an able person in Terri's general state of health would never have been a candidate for such treatment. To others the issue is the intrinsic value of human life as the image-bearer of God, and man having no authority from God to take it under these circumstances. What I see here is the basis for some real cooperation between these two groups. If we can manage to work together, we can save some lives. What we agree on is that sustenance and medical care ought not be withheld from people because they are disabled and because they cannot speak for themselves. Baby John Doe is born with an obstructed esophagus. A fairly simple, and rather common surgical procedure will clear the obstruction and enable Baby John to eat. Will the procedure be done? If John is otherwise normal in his development and condition, there is no question. He will have the surgery and live. However, if John is a Downs Syndrome baby, a condition that also causes mental retardation and other disabilities, there is a question. Many Downs Syndrome babies are born with this condition and some are denied the procedure and die from lack of food and water. Both the disability advocacy crowd and the pro-life crowd think Baby John Doe should be protected. When you look at the lobbying power of these two groups, their sphere of influence is huge. The disability advocates have the ear of the left, the pro-life crowd has the ear of the right. So can we work together and get this thing done? Can we band together and protect the lives of folks like Terri Schiavo and Baby John who cannot speak for themselves? I think we can. What could destroy efforts at cooperation on this is the issue of euthanasia. The right might wish to prohibit all euthanasia and the left may wish to firmly establish a "right to die," for those who can clearly communicate that choice. If we can discipline ourselves to leave those issues out of any proposed legislation and narrowly define our purpose for now to protecting the voiceless disabled, we can avoid the disagreement that could derail our efforts. I am not suggesting anyone compromise their principles on this. I am suggesting the issues be treated separately rather than lumping them together, for the sake of the Terris and Baby Johns of this world. Left and right can work together on this and do some good. We can protect the lives of many people, especially infants and those whose disabilities diminish their consciousness, intelligence, or communication abilities. So let's do it. Let's start asking our legislators for this. Let's start writing about this issue. Let's start asking the established advocacy groups for pro-life and disability causes to use their lawyers and their lobbying power to help us get this thing done. U.S. District Court Judge James Whittemore has denied the Schindler family's request to reinsert Terri Schiavo's feeding tube. The family has appealed the decision to the 11th U.S. Circuit Court of Appeals, another court that has in the past turned down requests to save Terri. At about 1:45 this afternoon it will be seven days since her feeding tube was removed. Family members report that she is showing signs of severe dehydration. See the Yahoo News report here. In spite of the efforts of Congress to secure a review of the facts of Terri's case by a Federal court, this has still not happened. All of these appeals have ruled on the process alone, and not on the actual facts of the case (that she is PVS, that she had expressed a wish to die) as they were originally established by Judge Greer. We hear much about about how many judges have ruled on this, but only one judge has ever ruled on these facts. How is it, that even after the dramatic move by Congress on Palm Sunday, this poor woman has never had a lawyer and never had an opportunity to have even a second judge render a judgement on the "facts" that have condemned her to death? UPDATE: The 11th Circuit Court has denied the Schindlers' appeal. UPDATE Saturday 12:13 pm: Judge Greer has denied the Schindlers' request to insert a feeding tube or at least an IV for hydration while new information is considered, including a Schindler Attorney's claim that Terri tried to say "I want to live," when prompted to do so on March 18th. You can read that attorney's account of that event here. Terri's Supporters Are All Fundamentalist Christian, Far Right Republican, Anti-choice Oppressors, Redneck Conspiracy-Theorist, Fascist Kooks....NOT! I'm hearing a lot about how right-wing radical America is attempting to impose its disgusting will on the the rest of the country in regards to the Terri Schiavo case. However, I have noticed that support for Terri Schiavo is, in fact, coming from a wide variety of sources and perspectives. This case really does cross political and religious lines. So I thought it would be fun, and instructive to gather together some links to Terri's supporters that don't fit the stereotype. Lanny Davis, White House Counsel to President Bill Clinton, told Bill O'Reilly, "I think this is a personal decision that I made about the merits of erring on the side of life where we're not certain about this poor women's wishes. We have a husband who claims what she said is that she wanted to be disconnected. But we're not certain. And at least in this instance, which is rare, where you have parents willing to go through the pain and the agony of tending to this poor young woman, we ought to err and allow those parents to do that." Democratic Senator Barbara Mikulski of Maryland, explained her support for Congress' actions on behalf of Terri Schiavo to a Washington Post reporter in this way, "This is a terrible tragedy. There was no living will and the family was divided, I felt that it was appropriate under these unique circumstances that the court take one last look at this." Disability groups, with traditional Democratic ties have supported Terri's cause. Boston Globe writer Nina J. Easton writes, "Prayers and references to a ''culture of life" have defined the public face of the emotionally-charged Save-Terri Schiavo movement dominating the airwaves this week. But a critical piece of the coalition is disability rights groups, whose ties to Democrats could produce bipartisan legislation creating a more extensive federal role in cases involving the removal of life support." Harriet McBryde Johnson, a progressive disability rights attorney wrote, Not Dead at All: Why Congress was right to stick up for Terri Schiavo. Self-described liberal and lesbian writer of the blog Lesbien C'est Moi, writes, "My liberal friends, my conservative friends...this is not about any other person, it is not about politics, it is not about ideology. It is about Terri and her right to NOT be executed. If I sleep tonight, it will only be with the desperate hope that tomorrow morning brings a stay of execution for Terri." The author of Trials and Turbulations: Tales from a Patriotic Liberal, describes himself herself [sorry] as agnostic, pro-choice, and pro-euthanasia. Answering a commenter who sought to define life by what a person could do, he wrote in support of Terri, "Based on this logic, this means that everyone who cannot function properly must die. For two years of my life at one point in time, I was incapacitated. Going by the above theory, I wouldn't be alive typing this right now. What about mental patients in the psychiatric wards in hospitals? What about those in regular hospitals? What about those in ICU? If A.R. 's theory were to be enforced, there would never be a need for hospitals, right?" A reader alerted me to the concerns Civil Libertarian Nat Hentoff has about this case. Read his Village Voice articles here and here. Thanks to Judith for leaving, in the comments, links to a report of the words of Democratic Senator Joe Lieberman and to her own writing at her blog Kesher Talk. The Rev. Jesse Jackson: I feel so passionate about this injustice being done, how unnecessary it is to deny her a feeding tube, water, not even ice to be used for her parched lips. This is a moral issue and it transcends politics and family disputes."